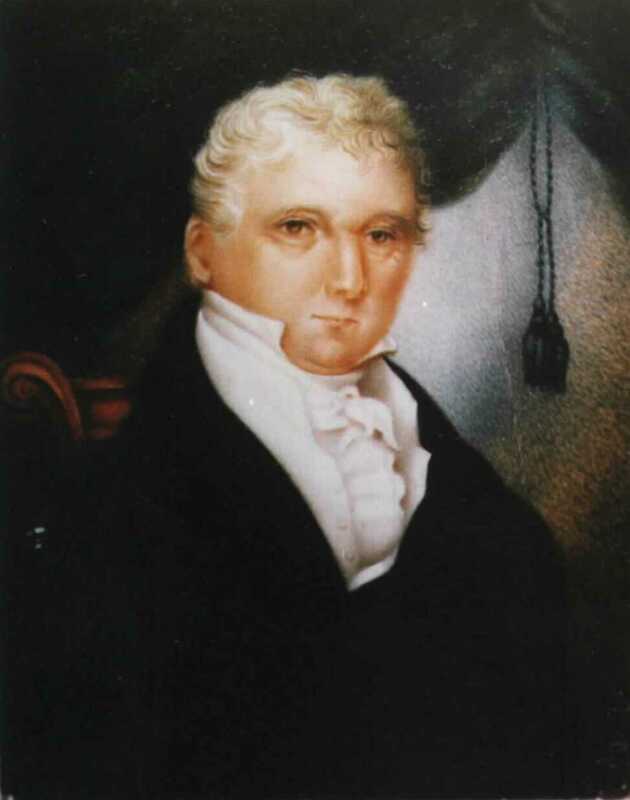 Simeon Lord was born in the village of Todmorden in Yorkshire, England, on 28 January 1771. His parents were Simeon Lord and Ann Fielden. Much has been written about the Fielden family, and it is after their home in Yorkshire that Simeon renamed the farm he bought in Sydney, "Dobroyde". In 1790, Simeon was charged with the theft of some cloth, and although he proclaimed his innocence, was found guilty on 22 April 1790, and sentenced to 7 years transportation to Australia. He landed in Sydney as part of the third fleet on board "Atlantic", on 20 August 1791. The prisoners had embarked at Woolwich, and sailed from Portsmouth. Atlantic was the first ship to sail non-stop to Rio de Janeiro and then to Sydney. The passage took 146 days, and there were 18 deaths. On board were 220 male convicts, no female. Simeon was luckier than most, as he had some money and was assigned on board to Captain Thomas Rowley, who encouraged him to invest part of his funds on the trip to Australia. Lord made a profit from this investment, and never looked back. In Sydney, he was again assigned to Rowley, assisting him in his business affairs, and learning how to make his own fortune. 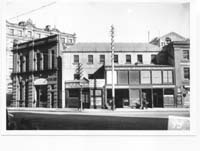 Lord was later assigned to a baker, Mrs Bligh, in the Rocks district of Sydney. By 1798 Lord was free man, and trading in his own right. On 27th October, 1814, Simeon Lord married Mary Hyde. The couple already had 5 children, and had a further 3 after the marriage. Mary also had two children, Mary Ann Black and John Henry Black, prior to beginning her relationship with Lord. Mary Hyde was transported for 7 years for theft, and had shortly after her arrival formed a relationship with John Black. In 1802 John Black was lost at sea. Also living with the family was Johanna, the adopted daughter of Simeon Lord, who married Francis Williams. Lord was also the guardian of Louisa Skinner, the daughter of Samuel Skinner and Mary Watkins. When Louisa married John Henry Black in 1827, it was with Lord's consent. Sarah A Ramsay (Lord's daughter) was a witness to the marriage. 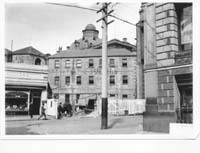 Simeon and Mary lived in Macquarie Place, Sydney, where Lord owned a large home and warehouse. They later moved to Banks House, Botany. Go to the next page headed Simeon Lord to see more about his business exploits. In researching the Lord Family Tree, I have had assistance from many people, mostly descendants of Simeon Lord. I would like to recognise here the help given by Joan Nicholls, Barbara Lord, Jean Marginson (dec'd), and all the Ramsay and de Mestre researchers who have helped along the way. 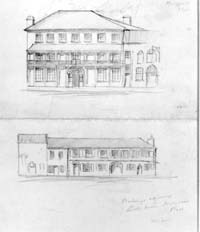 These two pictures show Lord's house just prior to demolition.